Ta-ta, TINA. That’s as in “there is no alternative,” which has been the description of common stocks in recent years while interest rates hovered near zero. But TINA is getting dumped by investors who, according to Bianco Research’s Ben Breitholtz, are having a “new love affair with cash.” Not literally the folding green stuff, but supersafe, ultraliquid investments. Exchange-traded funds investing in short-term government securities recently have been attracting 33 cents out of every dollar going into ETFs of all asset categories, he wrote on the Bianco website early in the week. That’s confirmed by the stampede into Treasury bills by the Thundering Herd, according to Bank of America Merrill Lynch’s global investment strategy team led by Michael Hartnett, as the firm’s clients ramp up their holdings of the safest, most liquid investment on the planet. As noted here last week, short-term T-bills provide nearly the same yield as dividends on the S&P 500, which may be why TINA seems a bit fey these days. Hartnett & Co. also note that equity funds suffered their second-biggest weekly outflow, some $29.7 billion, last week. Since the beginning of the year, there has been a big turnaround in flows into equities. From a gusher of $103 billion in the first five weeks of 2018, when stocks seemed on an unstoppable ascent, the inflows slowed to $31 billion over the next five months, before reversing to a $50 billion outflow in the most recent five days. Those outflows probably weren’t helped by Monday’s stock swoon, which featured a 2.1% drop in the Nasdaq Composite, supposedly over feared curbs on Chinese investments in the U.S. as part of the escalating tariff war. While many components in the tech-heavy index would be hurt by curbs on trade and investment, among the biggest losers that day was Netflix (ticker: NFLX), which shed 6.5% on the session, and which would hardly be affected by any tariff dispute. More likely, some profits were being cashed in ahead of the end of the quarter and the half-year, as the “N” in FANG was still up over 100% for the year after Monday’s drop. Big Tech still has been 2018’s big winner, with the Invesco QQQ Trust (QQQ), which tracks the biggest Nasdaq stocks, posting a total return of 10.63% for the year through Friday, according to Bloomberg, with 7.43% coming in the past three months. For the broader large-capitalization sector, the SPDR S&P 500 ETF (SPY) returned 2.54% year to date, boosted by a 3.56% return in the past three months. Small-cap stocks, supposedly less affected by global factors, also were winners; the iShares Russell 2000 ETF (IWM) returned 7.66% for the year through Friday, with a bit more (7.86%) coming in the past three months. At least all of those numbers had plus signs, something that China’s stock market can’t boast. The decline in the Shanghai Composite put it into bear market territory with a drop of more than 20%. Trade tensions appear to be weighing more heavily on the Chinese market, which also has had to cope with a slowing domestic economy. What’s got global market watchers worried is that China’s stocks are sliding in tandem with its currency, the renminbi or yuan. Until recently, the yuan had been declining versus a rising dollar; relative to a basket of its trading partners’ currencies, it actually was up 5% over the past year, according to JPMorgan global markets strategist Nikolaos Panigirtzoglou. 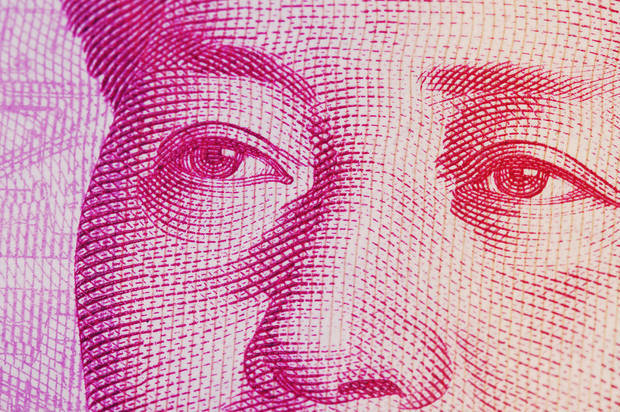 In the past two weeks, however, the yuan has slid 3.5% against the greenback, 2% on a trade-weighted basis—big moves for a currency that is relatively tightly controlled by Chinese authorities. The central bank also lowered the required reserve ratio, injecting the equivalent of $100 billion into the banking system to counter the impact of the tariffs, which also tends to weaken the yuan. That suggests China is using the exchange rate as a weapon. “The most effective way for China to retaliate [against] rising U.S. tariffs is to weaken” the yuan, according to the July Bank Credit Analyst. That could roil financial markets, however. The dual declines in China’s equity market and currency are raising concerns of a repeat of 2015. Treasury strategists at NatWest Markets recall that the drop in the yuan that summer sparked severe equity market losses, including a 10.5% correction in the S&P 500. China’s currency is also having an impact on emerging markets, especially those in Asia, which have already been under pressure from the tightening of Federal Reserve policy (as well as local factors in Brazil and Turkey). “It seems like this is a particularly vulnerable time for the currency of world’s second-largest economy to be accelerating” lower. For that reason, the yuan is the first thing they say they check in the morning. “In all, the combination of equity market declines and currency depreciation pressures revive memories of 2015, and this combination has the potential to unsettle risk markets,” Panigirtzoglou concludes. One more reason to abandon TINA for T-bills. Could the factor that precipitated the disturbances in the markets in early 2018 re-emerge to roil them anew in the second half? David Levy, who heads the Jerome Levy Forecasting Center, thinks it could. The bond and stock markets were rocked after the release of the January employment data, which showed average hourly earnings rising at a 2.9% year-over-year rate. Those unexpectedly rapid pay gains aroused market fears of more aggressive interest-rate increases, which in turned spurred sharp selloffs in stock and bonds with a surge in volatility. While worries about the Federal Reserve and its reaction to inflation have since eased, Levy thinks the markets’ equanimity (or complacency, depending on how one views it) could be upset. “Indeed, accelerating pay rates are likely to provide a big surprise in the second half, potentially dominating interest-rate behavior along the way,” he writes. Economists, including those at the Federal Reserve, have been generally nonplussed by the relative modest rise in pay, as the labor market reached—and surpassed, by most definitions—full employment with the headline jobless rate of 3.8%. “What many people do not fathom is that labor markets do not tighten in consistent, linear fashion as worker availability diminishes and then scarcities intensify,” Levy says. It appears that the jobs market is at, or close to, that tipping point. In particular, the latest Job Openings and Labor Turnover Survey, or Jolts, showed more job openings than job seekers. Another barometer: The National Federation of Independent Business found the largest share of small businesses raising compensation in 34 years in May. Yet, Levy continues, a generation of investors and managers have not experienced any persistent rise in inflation. Since 1995, the core consumer-price index, which excludes food and energy, has not exceeded 2.5% annually by much or for long. They also have no memories of the 4% to 5% inflation of the late 1980s, let alone the double-digit inflation of the late 1970s and early 1980s. And the false alarms about inflation as the jobless rate has declined have made all of those earlier increases seem like ancient history. Economists have theoretical debates about the ability of central banks to set an ideal interest rate to keep the economy controlled “as if setting a clock.” But these ignore the real world. Employers in strong sectors, such as plumbing contractors, truckers, and the oil industry, are having to compete aggressively for workers. “Indeed, when businesses start losing employees because of better offers across town, it may be much more alarming than when a growing company cannot find workers to add,” Levy writes. If labor does truly gain the upper hand and starts to see pay gains, the possible sustained increase in inflation could make this workers’ paradise short-lived, he continues. “That is because acceleration in inflation virtually assures [that] rising interest rates amount to a death sentence for financial stability here and abroad: Either the Fed would have to raise interest rates much more than private balance sheets here and abroad can tolerate, or else markets would price in future Fed hikes that would do similar damage,” he concludes. The capitalist class would suffer first, Levy suggests. Higher rates would hit global financial market conditions and domestic asset markets before they could materially weaken the economy. There is an alternative scenario in which higher labor costs do not feed fully through to prices. Businesses may not be able to pass on higher costs and absorb them instead, to the detriment of profit margins. The recent U.S. corporate tax cuts provide more leeway for businesses, but tighter margins aren’t a plus for earnings growth. In any case, Fed Chairman Jerome Powell has pointed out that the past two recessions followed financial unrest, first after the bursting of the dot-com bubble in 2000 and then the financial crisis of a decade ago, rather than inflation. The market eruptions of early February suggest how inflation could feed into financial instability. For that reason, the June jobs report due out on Friday should provide the main action in the coming holiday-interrupted week. Even more than the payrolls data (a gain of 185,000 is the consensus forecast, solid but short of May’s 223,000 rise), average hourly earnings are expected to attract scrutiny. Those data are forecast to show a 2.9% year-over-year increase, the same gain that roiled the markets five months ago. A number with a “three handle” could spark some post–July Fourth fireworks in the markets. MADRID – After the recent G7 summit in Quebec, there can no longer be any doubt that the West is in crisis. Yes, “Western” countries have often pursued divergent foreign policies (as illustrated by the Iraq War), and “the West” is itself a vague concept. But it is one that rests on a set of common ideological pillars, which are now crumbling under the weight of US President Donald Trump’s “America First” agenda. Trump and his coreligionists’ incessant slandering of allies – “we cannot let our friends take advantage of us” – is leaving its mark. Putting aside his apparently unconditional support for Saudi Arabia and Israel, Trump seems prepared to destroy the essential strategic understanding that the US has long maintained vis-à-vis its allies. Just a few years ago, it would have been unthinkable for the US to refuse to sign a joint G7 communiqué. Nor would anyone have thought that an American administration could attack a Canadian leader using the language that Trump and his trade adviser, Peter Navarro, recently directed at Canadian Prime Minister Justin Trudeau. After his summit with North Korean dictator Kim Jong-un in Singapore, Trump insisted that he has a “good relationship” with Trudeau. Yet he hastened to add that he also has “a very good relationship with Chairman Kim right now.” Suggesting that US relations with these two leaders are comparable is not just clumsy; it is absolutely foolish, and reflects a chilling lack of perspective on Trump’s part. If bad manners were the only issue with the Trump administration, we could all rest easier. But that administration is also pursuing concrete policies that are undercutting America’s most important alliances. 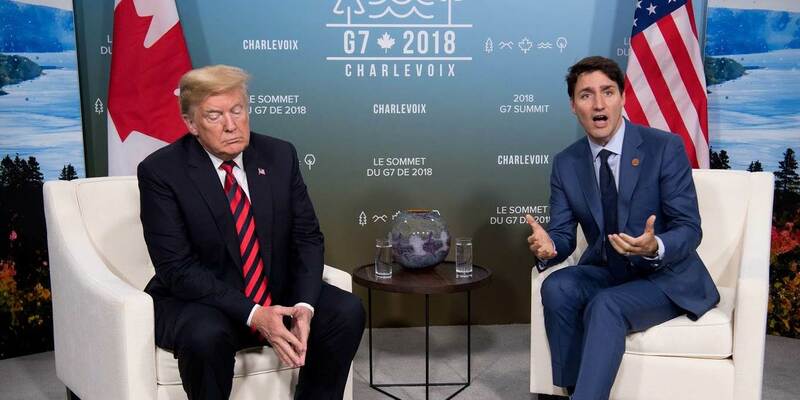 The US tariffs on steel and aluminum imports from Canada and the European Union made reaching a consensus at the recent G7 summit all but impossible. Trump’ tariffs will hurt not only foreign exporters, but also US workers and firms in sectors that depend on steel and aluminum inputs. Yet Trump seems impervious to facts and economic logic. To justify his self-defeating policies, he cherry picks isolated cases such as Canada’s high tariffs on dairy products, presenting them without any context, while overlooking the fact that America’s weighted average tariff rate is actually higher than that of the EU, Japan, and Canada. While the G7 summit was descending into mutual recrimination, another highly significant meeting was taking place on the other side of the world. In the Chinese city of Qingdao, the Shanghai Cooperation Organization – comprising China, India, Kazakhstan, Kyrgyzstan, Pakistan, Russia, Tajikistan, and Uzbekistan – was holding its annual summit. And as the Communist Party of China’s main official newspaper took pleasure in noting, the encounter between Chinese President Xi Jinping and Russian President Vladimir Putin was far more cordial than the one between Trump and the other G7 leaders. Understandably, Trump drew additional fire at the G7 summit when he suggested that the group readmit Russia, which was kicked out after its annexation of Crimea in 2014. Still, he was touching on something that can no longer be ignored: the excessive compartmentalization of geopolitical clubs. The fragmentation of global governance is likely to prove increasingly unfavorable to Western interests. Rather than recede toward isolation and diminished influence on the world stage, Western leaders should expand the scope and scale of cooperation in the search for solutions to global problems. To that end, they should promote forums for dialogue – such as the G20 – that bring together today’s major powers. But Trump’s conciliatory approach toward Russia faces tall hurdles. Putin’s foreign policy has become increasingly hostile to Western security arrangements, and Trump’s relationship with the Kremlin has given rise to serious concerns, domestically and internationally. This has been exacerbated by his arrogance toward America’s European allies. To be sure, after some hesitation, Trump did affirm his commitment to NATO’s mutual-defense clause last year. But that doesn’t mean tensions have dissipated: Trump has continued to demand that other NATO members increase their military spending. What Trump doesn’t seem to understand is that such spending increases would go not toward the NATO budget or toward paying America for its protection, but rather toward enhancing each country’s own defense capabilities. In fact, the EU has already established the so-called Permanent Structured Cooperation to increase security and defense resources and use them in a collective – and thus more efficient – manner. The Trump administration should welcome such measures. And yet it seems to respond with skepticism to every joint initiative that the EU launches. During the 2016 US presidential campaign, Trump supported the United Kingdom’s bid to withdraw from the EU. Since taking office, his administration has not hesitated to weaken the bloc whenever it can. Just a few days ago, Richard Grenell, the US ambassador to Germany, said that he is working to “empower other conservatives in Europe” – a clear departure from diplomatic protocol. Of course, the Europeans whom Trump and Grenell would support are not really conservatives, but reactionaries. Their goal is to reverse the progress that we Europeans have made in advancing our shared project. Trump evidently feels more comfortable when he can engage with other countries bilaterally. It is little wonder that the EU – a bastion of multilateralism – is not to his liking. But Europe and America have always been most successful when they have supported each other, while operating within a framework of institutions based on shared norms. Trump’s preference for a divide-and-rule strategy produces a game that will create only losers, beginning with the West and ending with the world at large. Javier Solana was EU High Representative for Foreign and Security Policy, Secretary-General of NATO, and Foreign Minister of Spain. He is currently President of the ESADE Center for Global Economy and Geopolitics, Distinguished Fellow at the Brookings Institution, and a member of the World Economic Forum’s Global Agenda Council on Europe. Predictably, last week’s Singapore summit was long on pomp and short on substance. The summit was rushed, leaving insufficient time to hammer out anything more than a symbolic statement in which Pyongyang committed to even less than it did in talks with the Bill Clinton and George W. Bush administrations in 1993, 1994 and 2005. More important, neither North Korea nor the U.S. was prepared to make any meaningful concessions on their red lines anyway. It’s doubtful that the U.S. will have the leverage to force the North to agree to a formal deal on complete, verifiable and irreversible disarmament anytime soon. However, the outlines of a tacit deal on the size and shape of the North’s nuclear and missile arsenals are beginning to take shape. In fact, the bulk of such an arrangement might already be in place. And it could have considerably more staying power than the meatier deals with North Korea that were repeatedly inked and scrapped in the past. Ahead of the summit, to avoid backing itself into an untenable political position that would bolster Pyongyang’s negotiating position, the White House began lowering expectations for the talks. Since then, the Trump administration has been referring to it as merely the first step in a long process toward denuclearization. This week, the U.S. took the next step by announcing the suspension of annual major joint military exercises with South Korea, with the stipulation that they will resume if the North bails on its commitments, though it’s still unclear what steps the U.S. expects to see. Whether or not the North is serious about giving up its nukes, we would expect a series of reciprocal good faith measures like Washington’s freeze on drills, Pyongyang’s freeze on missile and nuclear tests, dismantlement of test facilities and so forth. In any standoff with stakes this high, either side would need to move extremely cautiously to avoid getting played by the other, meaning this phase could easily take years. But to demonstrate that it is indeed serious about denuclearization, the North would eventually need to take a step that can’t be quickly reversed. Test freezes can end with the flick of a match, and test facilities can be rebuilt (for missile tests, very quickly) – as was the nuclear cooling tower the North blew up in 2008 in exchange for concessions from the United States. Denuclearization will remain notional until the North concedes, at minimum, something on par with what Iran did in 2015, eliminating part of its stockpile of fissile material and giving inspectors the near-unfettered access needed to detect new weapons-grade enrichment. The problem for the U.S. is the North has yet to express a willingness to hand over its nukes, particularly within the 2.5-year timeline laid out by the White House. In Pyongyang’s view, denuclearization means effectively the same thing as what the U.S. agreed to in 1968 when it signed the Nuclear Nonproliferation Treaty, which requires nuclear states to pursue disarmament at some point in a utopian future. And unless the U.S. is willing to go to war over the issue, there’s little reason to think that the North will back down. No U.S. guarantee can replace the sense of security that nukes give the North. China is unwilling to do what it would take to bring the North to its knees on Washington’s behalf. Ultimately, the North just isn’t important enough for the U.S. to go all in to disarm it. Without movement on either of the two variables that matter most in the standoff – the North’s willingness to hand over its hard-won nukes, or the willingness of the U.S. or another power to try to take them by force – the center of gravity will shift to secondary aims. The diplomatic process will focus on servicing respective political needs, managing the North’s behavior as a nuclear power, and jockeying for regional influence as East Asia comes to terms with its new reality. In this environment, the path of least resistance for both sides will be to accept that an indefinite “freeze for freeze” may be all that’s obtainable. The U.S. can live with this arrangement if it thinks it’s stopping the North’s intercontinental ballistic missile program short of being able to strike the U.S. mainland with any sense of reliability. In other words, it could stomach a nuclear North for some of the same reasons it’s been able to tolerate a nuclear Pakistan: Islamabad doesn’t have the missile technology needed to strike the U.S., and disarming the country would require an exceedingly costly war. Politically, the Trump administration will want to show that it has, in fact, brought the North to heel, but this could conceivably be managed with occasional, even if symbolic, concessions by Pyongyang that sustain a sense of momentum toward denuclearization. The North can live with this if it thinks the arrangement forestalls a U.S. attack in perpetuity, opens the door to sanctions relief, and undermines the ability of the U.S. and South Korea to oust the regime by force. It thinks the Trump administration now has a political imperative to stick with the diplomatic process. It already has a large enough nuclear arsenal to pose a deterrent, even if the lack of future testing may prevent it from obtaining larger-yield hydrogen bombs. And though its ICBM remain unproven, U.S. assets and allies are well within range of its more proven missiles, and its ICBMs – even if lacking proven re-entry and targeting technology – can at least fly far enough to theoretically put the U.S. within reach, potentially giving Washington still greater pause before attacking. More than anything, it effectively cements the North’s nuclear status, allowing Pyongyang to begin its pivot to economic development. South Korea can live with this arrangement because it forestalls a war that would put Seoul at risk of annihilation and creates space for it to pursue its own, more substantive rapprochement with Pyongyang in a less tense environment. Reports this week that Pyongyang and Seoul may open talks on moving artillery back from the demilitarized zone suggest that the North now feels secure enough to join the South on the risky road to reunification, even if both sides will proceed forward at a glacial pace. China, of course, has been proposing freeze for freeze for years. It can live with this because it avoids a war that would destabilize northeastern China and potentially put U.S. troops back on the Yalu River. Moreover, Beijing would be all too happy to see a deal that secures the U.S. mainland from the North’s nukes, while leaving Japan and South Korea at risk, helping to unravel the U.S. alliance structure in Northeast Asia. China doesn’t want to see a unified Korean Peninsula, but it thinks this dream won’t become reality for decades, if ever, and has ample ability to influence intra-Korean relations going forward. It would certainly trade unification for an expulsion of U.S. troops on the peninsula. Japan, meanwhile, will loathe this deal, but it’s simply not in a position to do much about it. This scenario is by no means guaranteed to play out, and there are myriad complications that could unravel the freeze for freeze. Seoul could get nervous about the erosion of military readiness, and instability in Pyongyang that empowers hard-liners keen to complete the ICBM program is always a risk. Perhaps most important, the North will hold quite a bit of leverage over the U.S. going forward, especially as an embattled and distracted Trump administration looks for signature foreign policy achievements to tout in its pursuit of re-election. In other words, the threat of a missile test at the height of campaign season will be an invaluable bargaining chip. China, which holds the key to sanctions relief, will certainly want the North to press this advantage to push U.S. forces off the peninsula altogether. Given how much Trump sees alliances as a waste of U.S. resources, he just might be inclined to concede. But the correlation of forces and prevailing political realities will continue to make a more decisive resolution to the standoff elusive. Geopolitics rarely writes tidy denouements. Beginning in early Spring, gold and silver faced two serious headwinds: Seasonality – that is, the annual decline in bullion demand from China and India once wedding season ends – and the internal structure of the futures markets, where the big players in gold had lined up in ways that historically point towards weak prices for a while. Both of these negatives are still in place (hence the smack-down of the past week) but both are transitioning to positive. 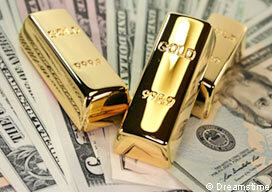 At some point soon, the precious metals environment will lose the headwinds and gain at least two strong tailwinds. In this market a bullish reading is when speculators are short and commercial traders are mostly long. As you can see, they’re not there yet but are moving that way fast. So we’re approaching a point where the market structure for both gold and silver point towards at least a few strong months. And good times for the metals should mean great times for the miners, which are about as beaten-down as they’ve ever been. The following chart shows just how boring and dispiriting the action in these stocks has been so far in 2018. The next chart shows what happened the last two times gold miners got this cheap, in 2005 and 2008. Both times they more than doubled off their lows in the next few years. Will they do it again? Well, at the risk of jinxing this great setup, the numbers – record debt at every level of every major society, a soaring global money supply, spiking political discontent – all point towards more turmoil and a much bigger resulting need for safe haven assets. The following chart shows the growth in global debt over the past three decades, with the green bars representing the decade ending in December 2017. If downturns caused by excessive fiat currency debt drove the past two central bank balance sheet expansions — which in turn drove the jump in precious metals — then the recent credit spike ought to be worth an epic run in gold and silver. As for what sets off the next explosion, consider margin debt, which is created when investors borrow against their stocks to buy more stocks. When this gets unwieldy, a wave of margin calls either causes or contributes to a cycle-ending bear market. If history is still a useful guide, we’re in for another bear market in financial assets, which sparks central bank easing, which lights a rocket under gold and silver. David Droga’s choice to open the Cannes Lions advertising festival this week was telling. Mr Droga, whose Droga5 agency is feted for its work for clients such as MailChimp and the New York Times, showed off a four-minute advertisement that it made for a Christie’s auction last year of a Leonardo da Vinci painting, “ Salvator Mundi”. “If it’s too long for you, I’m sorry,” he said defiantly. The ad, filmed on a hidden camera behind the painting, displayed the auction house’s visitors looking on in wonder, with some weeping. So then, people watching a rectangle on a wall for a long time and being moved by the artistry on show. It felt like the ad industry’s ultimate fantasy. Making emotional, unhurried visual ads is Mr Droga’s speciality, and the kind of thing that wins trophies in Cannes. But most debates this week were about technology rather than art — six second Snapchat video ad formats, behavioural targeting, artificial intelligence, “dynamic creative optimisation” and suchlike. This rapid-fire world of online ads is a long way from his ideal. That tension between art and commerce in marketing is intensifying. “Good advertising makes you feel something; you come out changed,” Mr Droga declared. But most advertisers simply want to find people as efficiently as possible and persuade them to buy things, whatever the format. That leaves the copywriters and video auteurs at agencies feeling unloved. The online and mobile revolution has encouraged a golden period of creativity for television — Netflix will spend as much as $8bn this year on dramas such as House of Cards, with long, sophisticated storylines. Meanwhile, advertising is crammed into smaller slices, with creatives such as Mr Droga and John Hegarty, co-founder of Bartle Bogle Hegarty crying out in pain. Marketing creativity is not dead, but it needs to be reinvented. The most interesting inventions in Cannes this week were not ads but new ways to reach consumers without making them pause in front of a screen. They included a playful machine devised by J Walter Thompson, which dispenses free Kit Kats to travellers in São Paulo airport if their flights are delayed. Or take what Yum China did when sales at its KFC outlets sagged because Chinese millennials were not enthusiastic about an old fried chicken brand. A consumer goods company would traditionally have used two tactics in that situation — changed the flavour or changed its advertising. Yum did a bit of both, but most of its effort went into delivering the product differently to consumers. Its main investment was a loyalty scheme tied to a mobile phone “super app” on which 120m members can pre-order food, choose the music in KFC restaurants and play a version of the Onmyoji fantasy mobile game with their friends. KFC even delivers food to members on some high-speed trains. Yum could have employed a traditional ad agency but turned to the Chinese operation of Isobar, a “digital transformation” agency instead. “The medium is the message,” Marshall McLuhan, the Canadian media theorist, wrote in 1964. That maxim has carried over from the television age to the digital one. The way the product is delivered is a form of creative marketing. A consumer product used to be a blank canvas on which an ad agency painted a picture for buyers — the distinction between Brand X and Brand Y had something to do with how they tasted but more to do with the feeling the ads evoked. “In the old days, you created a vision and tried to get the brand to live up to it,” says one ad executive of his agency’s work for companies such as Unilever and Procter & Gamble. Smaller brands that have gone direct to consumers via the internet, such as Dollar Shave Club, were quicker to realise that things were changing. The brand is more embedded in the thing itself — whether it is authentic, craft made and inspiring, rather than sugar water on a shelf. Even if the product is mass produced, like fried chicken, it must come to consumers freshly. It follows that less money is invested in big, evocative brand advertising of the kind that Mr Droga extols, and more in finding and engaging the sort of people who already like the product. Mobile display advertising is more like search — something simple and direct, targeted and “retargeted” (the ads that follow you around wherever you browse) at chosen individuals. There is still a place for creative advertising as the cornerstone for a digital campaign that offers versions of the same message in little pieces. But money is scarcer for grand visions: P&G, under pressure from slow sales and activist investors, is cutting $400m from agency fees over the next three years. Anything on which the return cannot be measured is vulnerable. One ad executive in Cannes worried at the industry being “juniorised” — that cheaper copywriters would be substituted for big thinkers because there was not enough in the kitty for the magical. Mr Droga will be fine, but those who follow him should think creatively about their future careers. This article has been updated to reflect the fact that Marshall McLuhan was a Canadian national. Home prices are still rising pretty much everywhere in the US, with California as usual leading the way. State-wide, the median CA home is now above $600,000, up 9% year over year. In San Francisco County, homebuyers are paying an average of 18% above the asking price, and price per square foot is now more than $1,000. Even Silicon Valley residents, who are used to this kind of thing, are finding it remarkable. See ‘Facebook is taking everything’: rising rents drive out Silicon Valley families. Most of the rest of the country isn’t California-level crazy, but it is at historic extremes: See US home prices are the least affordable in almost a decade. (Idaho Statesman) – In a study contained in the latest UCLA Anderson Forecast, released Wednesday, UCLA found that higher median rent and home prices are strongly correlated with more people living on the streets or in shelters. The research backs other studies that have found a similar relationship. Last year, Zillow released a study that showed a 5 percent rent hike in L.A. County – where more than 50,000 are estimated to be homeless – would cause 2,000 additional people to lose their homes. (The Day) – The housing markets that have seen the greatest increases in home values have also seen some of the most pronounced decreases in birth rates, according to an analysis by the real estate site Zillow. The company recently looked at the changes in values and birth rates in several counties in the United States between 2010 and 2016. It concluded that a boost of 10 percentage points in home values was associated with a drop of 1.5 percentage points in the birth rate among 25- to 29-year-old women. The effect was especially pronounced in California, where home prices have been rising rapidly in recent years. In Alameda County, in the Oakland area, home prices were up 60 percent between 2010 and 2016 while the birth rate among young women dropped by 24 percent. A 58 percent increase in home values in Santa Clara County, in the San Jose area, was associated with a 20 percent reduction in the birth rate. San Diego County had a 34 percent increase in home values and a 19 percent drop in the birth rate, while the birth rate in Los Angeles County was down 17 percent as home values rose by 31 percent. In San Bernardino County, home values were up 49 percent as the birth rate among young women fell by 8 percent. Orange County had a 28 percent increase in values and a 16 percent decrease in the birth rate. Outside of California, significant reductions in birth rates were observed in Texas, New York, and Washington. In Travis County, Texas, which includes Austin, home values increased by 33 percent and the birth rate was down by 22 percent. Home values in Seattle’s wider metro area of King County rose by 32 percent as the birth rate fell by 18 percent. The birth rate in Kings County, N.Y., which includes Brooklyn, was down 15 percent, while home values were up 36 percent. How much longer can home prices and rents soar before the damage becomes systemically dangerous? Based on the following chart, not much longer. Rising rents combine with stagnant incomes to produce a surge in “cost-burdened” renters – who presumably don’t have much left over to buy new cars, eat in pricey restaurants or do any of the other things that drive consumer spending, which in turn drives GDP growth.